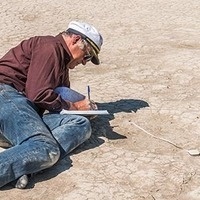 Museum paleontologist Greg Retallack recently uncovered 43,000-year-old mammoth footprints in Central Oregon's Fossil Lake. The tracks they left behind may reveal key insights into family dynamics among ancient elephants. Join him for an exploration of the evidence. Included with regular museum admission; free for MNCH members and UO ID card holders.